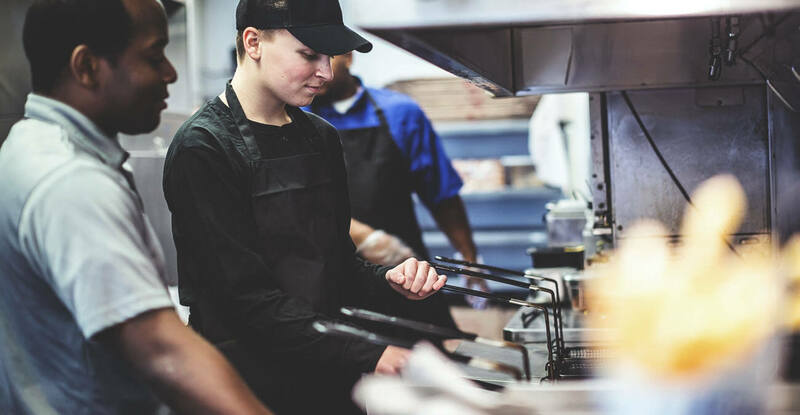 Your cooking oil is a vital component of your foodservice operation, and as you use your oil you know there are considerable costs tied to it as well. Prolonging the life of your oil just makes good business sense, and today we’re offering you some tips on how to get better longevity out of your oil. Read on, and to learn more about how you can maximize your oil’s benefits to your business, download our eBook, Focusing on Fryer Oil, today. Filter and skim constantly. The quality of your oil is as much about what’s in your oil as it is about what’s not in it. Consistent filtering and skimming of your oil will keep it free of debris, support your cook and improve your fryer’s efficiency. Your oil should be filtered twice a day and skimmed every 15 minutes. Establish the routine and stick to it. Cover them up. Not all of the debris that floats in your fryer oil is a product of the food you cook there. Covering your fryers when not in use prevents other foreign materials from finding their way into your oil, preserving the cleanliness of this resource. In addition, it also protects your fryers from oxidization, which can hasten the breakdown of cooking oil. Don’t overfill. Filling your fryers beyond the recommended oil level is wasteful and inefficient. Higher oil levels increase your risk of dangerous oil spilling or bubbling over onto the floor. In addition, the more oil you have in your fryer, the longer it will take your oil to reach the desired temperature, wasting energy needlessly. Cook where you should. While the cooking process of multiple food types may be similar, the foods themselves can vary dramatically. As such, it’s in your restaurant’s best interest to differentiate your fryers by material. Chicken wings, for example, leave blood in the fryers that can darken your French fries, and shrimp or fish can emit tastes that linger into other foods. Separate your wings and seafood whenever possible and your products will be better for it. Hot, but not too hot. As silly as it sounds, heat is bad for cooking oil because hotter temperatures break the oil down more quickly. Keep your fryers at no more than 350 degrees, and you can even turn them down to 280 degrees during lulls in meal service. Shake the ice. Ice and water cause more than just an intense bubbling when placed in your fryers. The combination of water and cooking oil actually forms acidic compounds that can affect your food’s taste. Removing all water before you cook will benefit everyone. Clean before you fill. When it is time to empty your fryer vats, clean your fryers thoroughly before refilling them. Doing so will prevent even the smallest grime accumulation from becoming a big, long-term problem. To learn more about preserving and magnifying the value of your fryer oil, download our eBook today.